Nina is a Thoroughbred owner, trainer and breeder for over thirty years. While farm manager of the Eddie Woods Stables for over nine years, she had the unequaled opportunity to be involved with the breaking and training process of not only Big Brown but other graded stakes winners and champions. 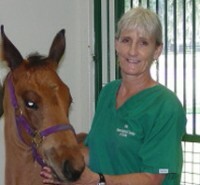 Upon leaving farm management in 2007; Nina started with Equine Medical Center of Ocala as a surgery nurse and the following year was moved up to Senior Surgery nurse. Orthopedic surgery and diagnostics are of particular interest; especially injuries in the athletic horse or race horse. Time spent with family and on the water are favorite pastimes.